It is with very heavy hearts that we announce the passing of our dad Ernie Lozier on December 10, 2017 with family by his side. Ernie was 88 years old. Ernie was born in Sainte-Rose, New Brunswick on February 1, 1929. He truly was the hardest working man we have ever known. The spirit to overcome any obstacle that was put in front of him carried dad through all his life. As a young man, dad spent many years running heavy equipment on a road construction crew. He was very skilled as an equipment operator and had a hand in building some of the highways that we now drive on. In 1955, Ernie was set up on a blind date, and that night he met a young lady by the name of Rose. Seven months later, on April 21, 1956, Ernie & Rose eloped in Coeur d’Alene, Idaho and then began their life together in Ernie’s cabin in Sicamous, B.C. Construction work meant that dad and mom were not able to put down roots for too long in any place. However, in 1968, Ernie and Rose and their two young daughters moved to Barriere and loved it so much that they decided this would be where they would call home from now on. Five years after moving to Barriere a third daughter would arrive. Dad was involved in the logging industry in the area and in time he had his own logging company. He worked successfully at that for years. Unfortunately, dad was injured in a very serious logging accident and spent 5 weeks in the hospital and another 8 months recovering at home. Dad tried to return to running his logging equipment, but was not able to continue after his injury. A true survivor, dad decided that he still wanted to work in the bush, so he purchased a team of work horses and spent the next few years horse logging. His daughter Diane worked along with him driving the team of horses. Then in 1985, dad embarked on his last career change. He worked with his brother Hector and learned how to build Gabion Walls. 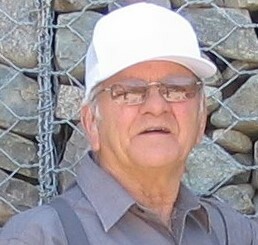 Dad was the first person in the area to introduce Gabion Walls, and he left a legacy of walls built with his own hands in Kamloops, Victoria, Vancouver, Texada Island and many in Alberta. Dad officially retired at the age of 80! However, his positive attitude and never quit spirit kept dad telling us that he would soon be returning back to work. 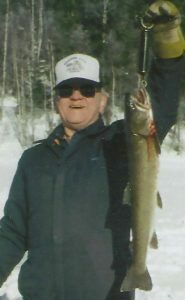 Dad loved to hunt and fish and some of our fondest memories are times that we spent outdoors with him sitting in a boat trout fishing or driving bush roads hunting deer and moose and then coming home and watching hockey on tv. In fact, even though dad’s health was failing, he made up his mind that he was going to go on one more ocean fishing trip to Prince Rupert. He went out fishing with his daughter and son-in-law, and wouldn’t you know it……..dad caught the biggest halibut of the trip! A true inventor at heart, dad was always a fixture out in his backyard working on some project or figuring out how to improve an existing one. We always said he was trying to re-invent the wheel. Dad loved to show visitors his latest invention. His sense of humour was priceless and dad was always the one that was quick with a joke and soon had the whole room laughing. He would help anyone, anytime, and his whole life he made deals simply with a handshake. Dad was a mighty man, and it was incredibly hard at the end to watch such a strong man fight a losing battle with his health. But his spirit always stayed strong. His passing leaves a hole in our hearts that will not be healed until we see him again in the Bible’s promised paradise. Ernie was predeceased by his beloved wife of 58 years Rose in October, 2014. Dad leaves to cherish his memory his daughter Diane Clarke (Bob) of Terrace, daughter Suzie Fadear (Shawn) of Barriere and daughter Raye-Ann duPied (Charles) of Barriere. He is also survived by his grandsons Clinton and Ryan, grand daughter Madison and great grandson Hunter. Ernie came from a large family and he is pre-deceased by many of his brothers and sisters, but is also survived by many brothers and sisters who mourn his passing. Dad was a bright light in our lives, and we already find ourselves looking for him and that spark that made him so special to us. We will keep him close in our hearts and minds as we remember him with such fondness. We are so grateful that we got to call Ernie Lozier our dad and we will love you forever!!! Thinking of all the family members of Ernie Lozier as you move forward without him. Our love and prayers are with you all. Our family thanks you for your kindness. Your dad, Ernie, was an amazing man and will be greatly missed by many.